Michael S. Hieser, “Does Divine Plurality in the Hebrew Bible Demonstrate an Evolution from Polytheism to Monotheism in Israelite Religion?” Journal for the Evangelical Study of the Old Testament 1.1 (2012): 1-12. Eugene H. Merrilll, “Deuteronomy and de Wette: A Fresh Look at a Fallacious Premise,” Journal for the Evangelical Study of the Old Testament 1.1 (2012): 25-42. Joel E. Anderson, “A Narrative Reading of Solomon’s Execution of Joab in 1 Kings 1 – 2: Letting Story Interpret Story,” Journal for the Evangelical Study of the Old Testament 1.1 (2012): 43-62. Todd Scacewater, “Divorce and Remarriage in Deuteronomy 24:1 – 4,? Journal for the Evangelical Study of the Old Testament 1.1 (2012): 63-79. John F. Hobbins, “Critical Biblical Theology in a New Key A Review Article,” Journal for the Evangelical Study of the Old Testament 1.1 (2012): 81-101. 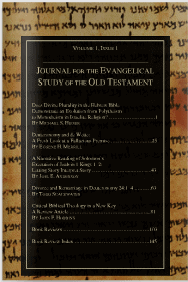 “Book Reviews,” Journal for the Evangelical Study of the Old Testament 1.1 (2012): 103-130. HT: Ancient Hebrew Poetry, which has a favourable review here.